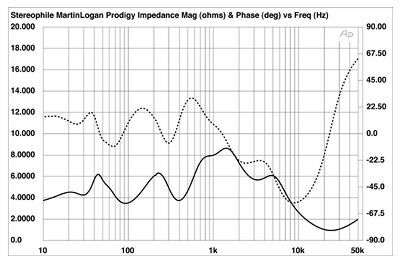 Amp suggestions for Martin Logan Prodigy speakers. I've got a new to me pair of Martin Logan Prodigy's in excellent condition. I am currently powering them with an Aragon 8008BB amplifier rated at 200 wpc 8 ohms and 400 wpc at 4 ohms. I love the sound, but can't help wondering if I need a better amp. My budget is in the $1000 to $3000 range. I realize that this will limit me to a used amp. I am open to both SS and Tube amps. Any ideas on where I should go here would be greatly appreciated! I have Prods also. They like power and lots of it. I have used Mac MC-7200 and 7106, Sunfire Cinema Grand, and Krell KAV-500 and my new acquisition which is a Krell KAV- 250a 2 channel amp. All of these have worked well although some were lacking in juice. The KAV-250a is the most powerful of my stereo amps with 250 into 8 or 500 watts per channel into 4 ohms and it does really well. It's not classic Krell class A but a damn good AB. It has good imaging and really good base. However Prods do like being bi-amped and I have used the MC-7106, Krell KAV-500 and the Sunfire CG with really good results. With that in mind I am thinking about another KAV-250a just for kicks and try bi-amping them with 1000 watts per speaker. These Krells can be had in the $1000 range and are underrated for sure. I rate them as a best buy in the used category. They also have MAT which is Multi Amp Throughout which lets you configure an amp to produce the same signal through both channels which is really cool for bi-amping. Unfortunately the Prods are 4 ohms because you can just bridge the Krells for 1000 watts but I think it has to be into 8 ohms. That is just insane. I don't think they can handle the Prod dang it. I'm not saying these Krells are the best ever but just a good value. I'd love to try some of the other higher end amps but like I said the Prods do like bi-amping so try to go down that road. Welcome to the Prodigy club. Hi Bobber, thank you for the welcome. I've been looking at the KAV series, but have been shy because some say they don't match up to some of Krell's other products. I even thought of bi-amping, but don't know how to go about doing that properly. Could you give me some tips on what that would entail? I know it means 2 amps, one for bass and one for treble. Could it be as simple as using that MAT feature and hooking up one channel of the amp for bass and one for treble, then matching that on the other side with another amp in the same config? Do you have to do crossovers to get that working to it's best? This is a bit confusing to me. Anyway, thanks for the idea. I will add the KAV's into the mix. Please elaborate on your setup idea a little for me. Normally you would use 2 "Y" interconnects from your pre to your amps. That MAT thing on the KAVs is cool but you do have to open the amps up to do it and open them again to go back to regular mode. The instructions are in the owners manual. It is really as simple as taking that metal jumper off the Prods connections and hooking up the amps. Yes, one channel for highs and one for lows. You need 2 matched amps or at least 2 matched in gain. I run mine in a home theater setup and my Pioneer HT will allow me to configure the front high speakers as one of the bi amp pre-outs so no "Ys" for me. The Prod owners manual says bi-amping will give you the best sound. Do you have it? Read page 8. I have a vintage Pioneer SF-850 electronic crossover which allows me to adjust the settings on the fly. I was thinking about plugging that in to just send the highs or lows to each separate amp channel. The theory is that amps do better with less frequencies to deal with. One could also argue that it is more electro stuff getting in the way and dirtying up the signal. It would be an interesting experiment.
" But look at what happens around 8kHz, a frequency where there is significant musical energy: an impedance of 3.55 ohms coincides with a capacitive phase angle of -58 degrees, which results in a much lower effective impedance in this region. A powerful amplifier capable of handling 2 ohm loads will work best with the Prodigy." The amps they used were Mark Levinson No.34 and Bryston 7B-ST monoblocks which is the sort of thing you should look at, Krells suggested above are also in that league. I would stay away from Tubes/Mosfets/Class-D and Mac's with output transformers.